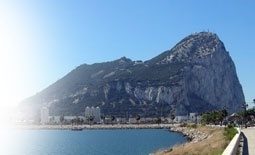 Gibraltar is a unique place to visit, and though perched on the end of the Iberian peninsula, it is a British territory with a long military tradition. The iconic ‘Rock’ with its famously forward Apes, is an imposing sight, and reaching the summit is rewarded with fabulous views of nearby Spain and even across the Straight to Morrocco, which can be visited on boat trips. Many places of interest on Gibraltar are steeped in military history, and best seen with the convenience of hire car collected at Gibraltar airport. Crossing the border into Spain, the port city of Algeciras boasts a fascinating maritime history, while further down the coast, the luxury resorts of Marbella and Puerto Banus draw famous faces from across the world. Gibraltar is often regarded as a ‘Little England’, and despite the unfamiliarly warm weather, British tourists report feeling right at home, with traditional British cuisine and high street shops (all VAT free) a big draw for many. Renting a car to collect at Gibraltar airport couldn’t be easier. Simply enter your dates and details in the booking engine, and we’ll give you a competitive quote. Choose your vehicle, confirm your booking, and we’ll do the rest!